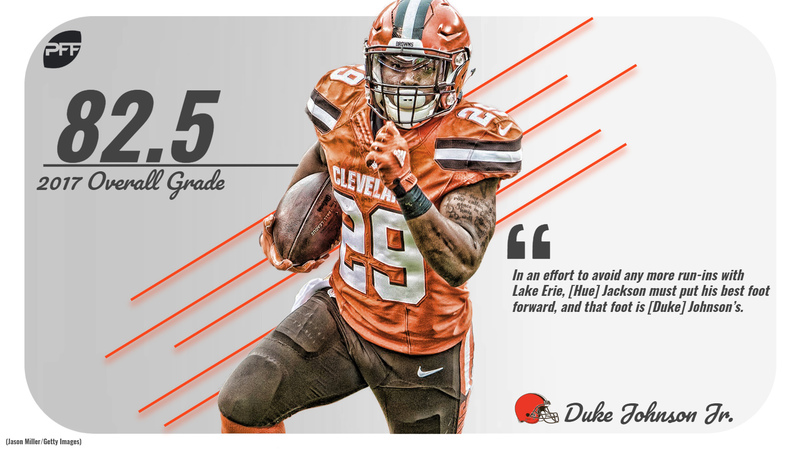 New Cleveland Browns general manager John Dorsey acted on his obvious aversion to the team’s 2017 rushing attack and its components soon after accepting the job, moving on from the Browns’ leading rusher Isaiah Crowell and replacing him with new faces in Carlos Hyde and rookie Nick Chubb. 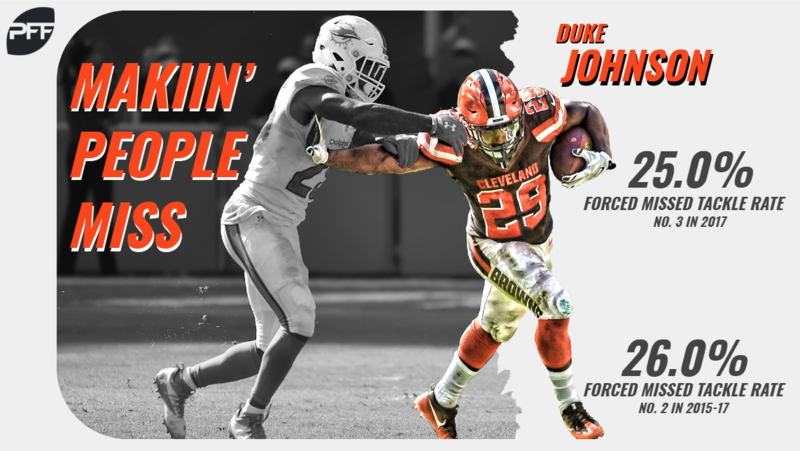 Dorsey, however, opted against cutting ties with Duke Johnson Jr. and has instead pushed more chips in his direction, a tell-tale sign of how where he sees Johnson in the backfield’s hierarchy. Johnson signed a three-year contract extension worth $15.6 million, including $7.7 million guaranteed, per NFL’s Ian Rapoport and Mike Garafolo. His average annual salary ($5.2 million) ranks tied for No. 8 among all NFL running backs. The 5-foot-9, 210-pound Johnson, though a bit undersized compared to the NFL’s bell-cows, defies stereotypes despite his stature. In 2017, Johnson rushed between the tackles 42 times for 202 yards, ranking sixth among qualifying running backs (min. 40 carries) in yards per carry (4.70) ahead of bigger backs like Marshawn Lynch (4.66) and Ezekiel Elliot (4.24). To Johnson’s credit, his work up the middle isn’t even his claim to fame. Johnson’s impact on the passing game, both from a volume and efficiency standpoint, is rivaled by very few in today’s NFL. He caught 74-of-90 targets for 693 yards and three touchdowns a year ago, ranking third in receiving yards and fourth in total receptions among all running backs. Despite his high volume of snaps in route, he ranked seventh in yards per route run (2.08) among running backs with at least 30 targets. With his sure hands, Johnson also dropped just 3-of-77 catchable targets. Unlike a majority of the league’s backs, Johnson had significant success running routes and catching the ball away from the backfield, as he ran north of 80 routes either in the slot or at outside receiver. Such positional versatility contributed to his fourth-ranked average depth of target (1.88) and eighth-ranked passer rating when targeted (100.8) among running backs with at least 60 targets in 2017. He also turned 44.6 percent of his receptions into either first downs or touchdowns this past season, which ranked fifth among the same group of backs. Of course, Johnson’s successes running between the tackles and catching the football are both propped up by his ability to make people miss in space. Johnson finished the 2017 season with the eighth-ranked elusive rating (65.5) among backs with at least 100 touches because of his ability to avoid contact altogether. Forcing 39 missed tackles across his 156 touches, Johnson ranked third behind just Alvin Kamara (28.4 percent) and Theo Riddick (26.3 percent) in missed tackles forced per touch at 25.0 percent. And for those under the impression that Johnson’s career year is just a flash in the pan, his efficiency in previous seasons tells a different story. He has averaged a whopping 26.0 percent forced missed tackle rate across his 447 career touches, which ranks second to Dion Lewis (27.8) among running backs with at least 300 touches over the past three seasons. Also, Johnson’s career yards per route run (1.83) ranks tied for third among running backs with at least 300 routes run from 2015-17. The real crime in the aforementioned set of numbers is Johnson’s 447 touches, as 28 other NFL backs have had more touches than him in the last three years despite only a handful coming close to his rushing and receiving efficiency rates. Dorsey’s decision to make Johnson one of the highest-paid running backs in football should change that. The aforementioned Hyde can provide value on early downs running the football, while he has shown to be a liability on passing downs. His three-year yards per route run (0.80) ranks 64th among qualifying running backs and no back in football allowed more pressures in pass protection than Hyde (13) in 2017. Similarly, Chubb is a destructive force carrying the football, but he had just 18 catches in his collegiate career and only four in his final season at Georgia. Both Hyde and Chubb have significant strengths in their game, strengths that should be utilized early and often in Cleveland’s offense, but neither of the two has shown enough to earn higher touch totals than Johnson in today’s pass-happy league. Thanks to Dorsey, Johnson is getting paid like a back that belongs in this league and if Jackson & Co. meet their end of the bargain, it’ll be money well spent.